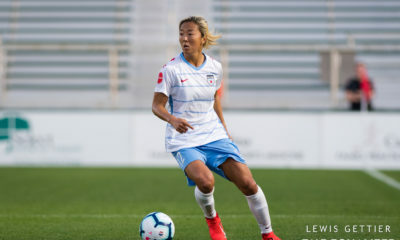 The last match of the weekend ended in a clear route, with the Reign crushing Sky Blue 4-1 courtesy of a brace from Megan Rapinoe, as well as a goal apiece from Jodie Taylor and Allie Long. Rapinoe’s stellar run of form, briefly interrupted by injury, continued with no cobwebs on Saturday night, and she made her impact known immediately. She disrupted play in just the 5th minute, dropping the ball off for Steph Catley to cross in front of Sky Blue’s goal, that Taylor got her head on authoritatively to send into the back of the net, putting the Reign up 1-0 early. The game calmed down a bit from there, with Sky Blue successfully frustrating the Reign enough to keep the scoreline intact, but Rapinoe couldn’t be denied in the 38th minute, when she ripped a shot from the top of the box into the upper 90 of Sky Blue’s goal, doubling Seattle’s lead. After the half Rapinoe wasn’t done, and in the 59th minute she collected a pass from Naho Kawasumi on the left side, took a few touches, and shot the ball far post to put the Reign up 3-0. However, despite the lopsided run of play, Sky Blue’s Savannah McCaskill never let up in her workrate, and got a goal of her own in the 62nd minute of something of a shross from out wide on the right. The game looked like it was barreling towards the final whistle at that point, but the match had one more goal in it for Seattle. In the 84th minute a short Reign corner found its way to Rumi Utsugi, who’s shot bounced off the post. The ball then only got as far as Allie Long, who nudged the ball into the goal to set the final scoreline, 4-1 favoring the Reign. 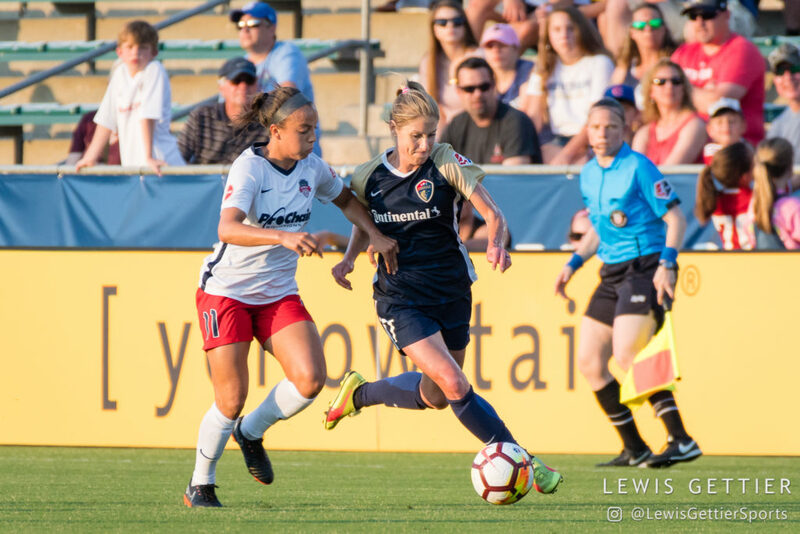 For the fourth time this season, the North Carolina Courage won at home by a 1-0 scoreline, this time defeating the Washington Spirit courtesy of a second-half Abby Erceg goal. The win extends the Courage’s undefeated streak to eight games on the year, keeping them atop the league standings with 20 points. Although the game went into halftime still scoreless, that wasn’t for a lack of attacking effort from the Courage. Crystal Dunn, who exited the match early in the second half, had a number of solid looks on goal in the opening 45, but Spirit goalkeeper Aubrey Bledsoe put her body on the line multiple times to deny each of Dunn’s chances. In all Bledsoe made four saves in the opening half, preventing a better Courage side from capitalizing on any of the opportunities they created. Bledsoe had a number of quality saves on the night, but Katelyn Rowland, getting the starting nod for the Courage while Sabrina D’Angelo deals with a left ankle sprain, had the most dramatic save of the night. In the 48th minute, the Spirit were awarded a free kick that Sullivan played in. Tori Huster tested Rowland with a shot off the set piece, but the keeper stretched out to her left to get a mitt on it. 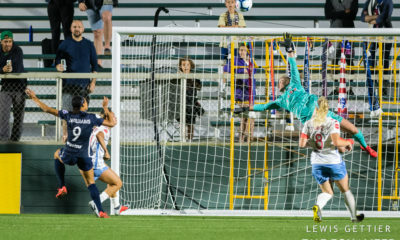 Mallory Pugh got to the deflected ball and attempted to score off the rebound, but Rowland was able to pop back up to block Pugh’s shot to pull off the double save. The lone goal of the match was scored in the 63rd minute when the Courage were awarded a free kick that, thanks to the position on the field, was much like a closer corner kick. Jaelene Hinkle took the free kick, and her service found an unmarked Abby Erceg, whose glancing header beat Bledsoe for the game winner. Up next for the Courage (6-0-2, 20 points) is a road match against Sky Blue FC on Saturday, May 19, while the Spirit (1-4-2, 5 points) host the reigning NWSL Champs, the Portland Thorns, at the same time. 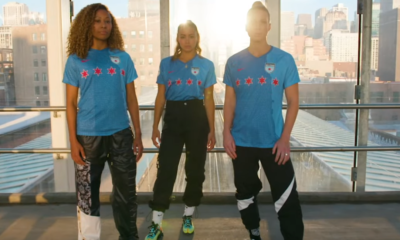 The Houston Dash twice went ahead of the Red Stars in Chicago on Saturday and the Red Stars twice rallied to equalize, eventually settling for a 2-2 draw at Toyota Park. The result extended the Dash’s unbeaten run to three games while the Red Stars are now winless in five though four of those have been draws. The Dash struck first on an early counter that saw Nichelle Prince slip Rachel Daly behind the Red Stars center backs. Daly completed the play with a curling finish around Alyssa Naeher who came out to challenge the shot. A defensive blunder allowed the Red Stars to equalize. Amber Brooks backed off a short pass out by keeper Jane Campbell and Arin Gilliland swooped in to make her pay. Gilliland rolled a pass to Sam Kerr who had at least half the goal in front of her from less than 10 yards out. Shortly after halftime the Dash went back on top off a set piece. Daly played it short to the middle of the box to Kyah Simon while Kristie Mewis rolled off the wall to the left. Simon’s quick touch found Mewis with no one following her, giving her the proper look and the Dash the lead. The Dash began to pack their defensive box but a wall ricocheted off Amber Brooks’s hand and Sofia Huerta scored on the ensuing penalty. 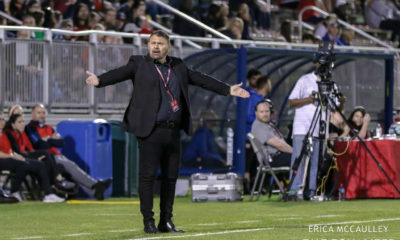 The Red Stars pushed late and found Kerr in front of goal in stoppage time but the Golden Boot holder was off the mark this time and the match ended in a draw. 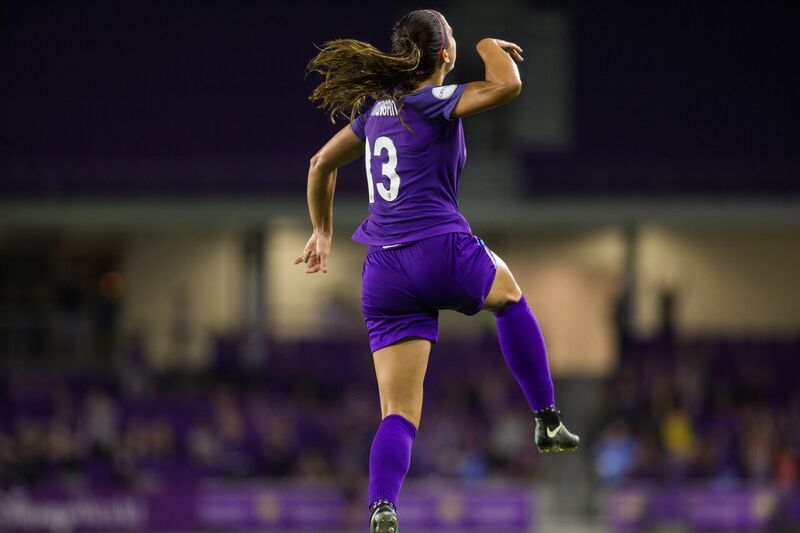 It wasn’t quite a classic, but a pair of early goals and some strong second half defense led the Orlando Pride to not only their first-ever point at Portland, but their first-ever win over the Thorns. Both teams rolled out with several changes to their starting lineups after midweek games. Portland gave Ellie Carpenter her first start, while Emily Menges returned to the team for the first time this season. Orlando flipped their midfield and attacking line, with Sydney Leroux, Marta, and leading scorer Chioma Ubogagu on the bench while Alex Morgan returned to the starting XI. Initially, the moves appeared to flatter the Pride. Portland had a goal called back for being offside in the 7th minute, and the Pride quickly responded. In the 11th minute, Kristen Edmonds served in a ball from the left flank, where it was easily gathered by Mallory Weber, moved to a defensive position in place of the absent Meghan Klingenberg. However, Weber flubbed her clearance, and Morgan jumped on the loose ball, slotting it past Britt Eckerstrom at the far post, a difficult angle as she was moving away from goal. Just ten minutes later, the Pride doubled their lead. Well outside the box, Christine Nairn collected a rebound from Midge Purce and lobbed a chip over Eckerstrom, who was off her line. However, the Thorns definitely weren’t out of it. In the 23rd minute, Tobin Heath sent in a corner kick, and Christine Sinclair made an unmarked run into the box, easily heading it in to cut the Pride lead in half. After the goal, the momentum shifted in Portland’s favor, where it stayed for most of the game. 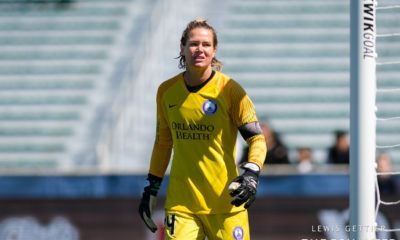 They easily had the share of possession, especially in the second half, and although the Pride occasionally threatened on the counter with Morgan or Rachel Hill, much of the action was in Orlando’s defensive half. Shortly after the second half began, Portland had yet another goal called back. Lindsey Horan made a play for the ball just as Ashlyn Harris went down to collect, and Purce put the spilled ball in the back of the net. However, it was ruled that Horan had fouled Harris. It was a very physical, chippy game, with a combined 24 fouls and four yellow cards, including one to Sinclair for a bizarre move when she attempted to poke the ball free from behind as Harris was picking it up, catching Harris’ leg instead. Although Portland served in ball after ball, the Pride did just enough in defense to keep the ball out of the back of the net, making 31 clearances as they limited Harris to only having to make five saves. Orlando is currently in second place, although that could change depending on the rest of today’s results. 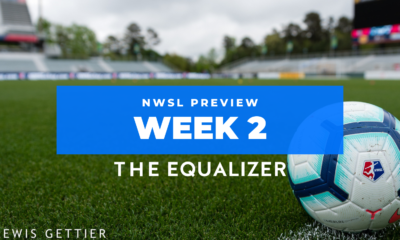 They have a bye week next week and return on Wednesday, March 23, to host the North Carolina Courage. Portland has dropped to fifth place and will travel to Maryland to face the Washington Spirit next Saturday.